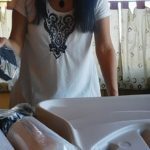 The automatic cat litter box comes to our life when we cannot or just don’t want to scoop our cat litter box and instead we want to enjoy our day doing something else or simply when we need to go away on trips and cannot do it during that time. You don’t want to go through the whole list of reviews? 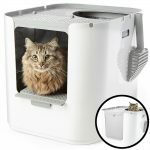 If you don’t want to go through all these reviews to decide which is the best option for your pet, I already made a selection of the best top 3 automatic litter boxes comparison chart where you will see the difference between the top 3 innovative technologies currently in the market: the Litter Robot, the ScoopFree, and the Catgenie. 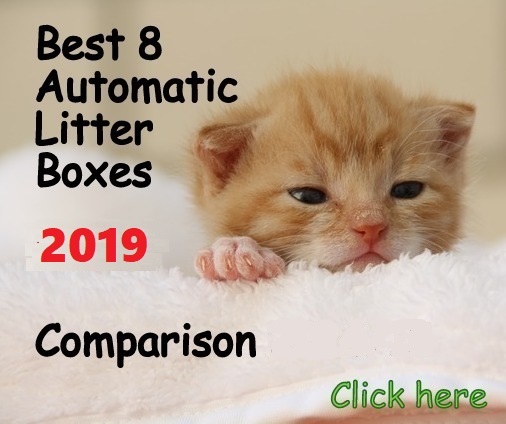 But if you want to see more than 3 options check the comparison of the 8 better rated auto litter boxes with lots of information that will be crucial in your decision. I created this comparison based on hundreds of customer reviews and also based on my personal experience. The best experts are we, the cat owners who deal with these devices on a daily basis. 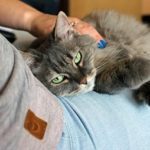 There are 6 important buying factors to know before buying a self-cleaning litter box that will help you to understand how they work and which system is more suitable for your type of cat. 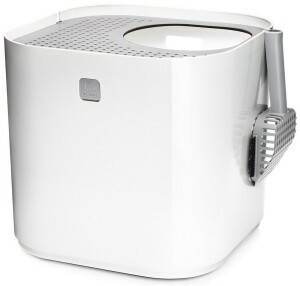 LITTER ROBOT III OPEN-AIR AUTOMATIC CAT LITTER BOX (4.9/5) Pay $25 less for your unit by clicking in our full review here. 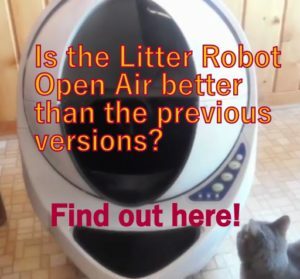 Litter-Robot Open-Air automatic litter box introduces new improvements over the past versions with its adjustable 3-7 minute wait time for cleaning cycles and a self-adjusting sensor that ensures reliability and sensitivity. 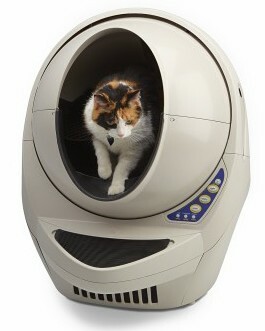 The Litter Robot III Open-Air features a larger ergonomic entry opening and litter chamber, accommodating bigger cats. The new design is modern and more stylish, making cats feel less enclosed when doing their business. For cats weighing 5 lbs up to approx. 20 lbs (max. weight will depend on the cat’s adaptability). If you don’t want to empty the litter box for 4-5 days or more. If you don’t want contact with cat’s waste. If you want a reliable unit. To use for two cats or more. If you need to be away for a few days. Great News! 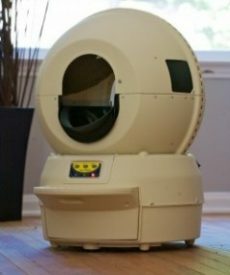 There is a new Wi-Fi version of the Litter Robot III! Now you can not only enjoy the most reliable self-cleaning litter box but also be able to manage and program the unit from your iPhone (Android coming soon). Click the Wi-Fi Litter Robot version and see my exclusive hands-on review with photos and videos with all the new features and get $25 Off your purchase! Here you can also learn how to upgrade the Open Air to make it fully connected if you already bought one. 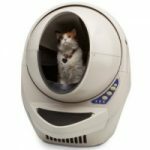 LITTER ROBOT II BUBBLE UNIT AUTOMATIC LITTER BOX (4.5/5)Litter Robot II Bubble Unit is the closest you can get to a maintenance-free automatic cat litter box. With its rotating scooping system, you won’t have to scoop the cat box again. The Bubble version with the Skylight-bubble type window located on the back of the Globe gives 3” extra room to the chamber area, accommodating larger cats and allowing natural light into the litter box. If you don’t want to buy cartridges or special trays. The Litter Robot II is one of the best and most reliable automatic cat litter boxes that will give you more time for yourself because you won’t have to scoop your cat litter box anymore. This is possible even if you have several cats. 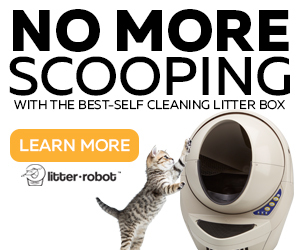 This innovative system works with a rotating mechanism that separates the waste from the clean litter 7 minutes after your cat has used the Litter Robot. If you are very busy and don’t have time to take care of the scooping task every day. 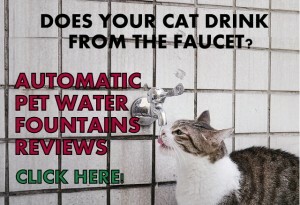 If you simply don’t want contact with your cat waste anymore. If you are looking for a reliable free scooping solution. 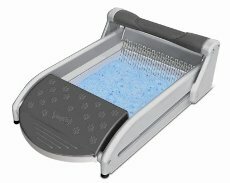 ScoopFree Ultra automatically rakes and cleans the litter box and it works with cartridges pre-filled with blue crystals to control odors because they absorb liquids and dry solids. 2 cats if you have a budget for changing cartridges (approx. $75-85 mo.) or if you want to use alternatives to cartridges described in the full review. ScoopFree is an automatic cat litter box that works with pre-filled disposable trays system that allows you to control urine and feces odor conveniently. These trays are filled with fresh blue crystals litter that absorb odor and helps you to maintain your house clean and fresh. With this self-cleaning litter box, you don’t have daily contact with the waste. If you want a disposable, convenient litter filling system. If your cat is “flexible” switching to new systems. 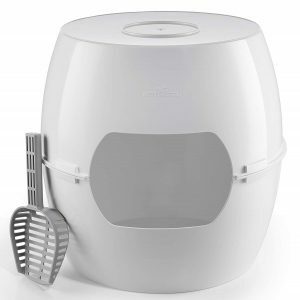 The CatGenie is a self-flushing, self-washing automatic cat litter box. With CatGenie you won’t touch the litter again. The system works with special washable granules (not litter). If your cat defecates firm stool. If you want to forget about scooping forever. If you have enough space in your bathroom or laundry room. 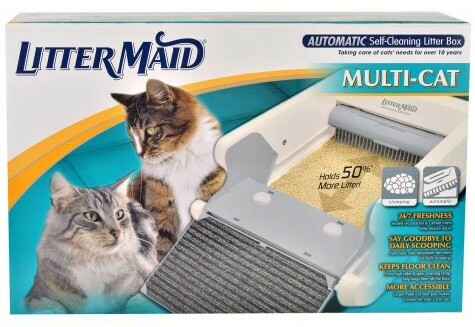 LitterMaid Multi-Cat self-cleaning litter box helps you keep the litter box clean, automatically scooping the clumps from the litter pan to drop them in a waste receptacle with a carbon filter to control odors. 10 minutes after your cat uses the Littermaid, it automatically starts cleaning the litter box through a special rake that collects the clumps, sifts them from clean litter and deposits them in the waste compartment. To see who I wouldn’t recommend this unit, check FULL REVIEW. 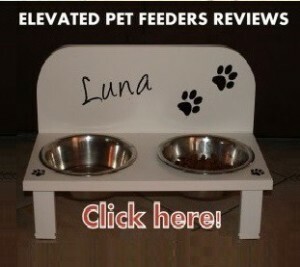 For kittens or small cats weighing less than 12 lbs. Use it with a single cat. Use it for weekends or short periods of time. Pet Zone Smart Scoop automatic litter box keeps your cat box clean and fresh because a smart sensor activates when your cat leaves the litter box and it automatically scoops the waste 15 minutes after your cat has done its business. Pet Zone uses a strong metal rake to collect the waste without pushing clean litter into the waste compartment, saving money on litter. The LitterMaid Mega Self-Cleaning Litter Box automatically scoops your cat litter box, collecting the waste into a sealed, disposable receptacle while a carbon filter activates to absorb odors. If you want an extra help to the scooping litter box task. If you want to use it occasionally when being away a couple of days. 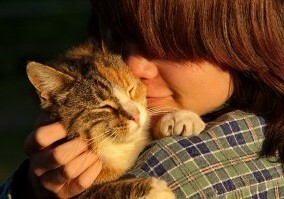 If your cat does not have stool problems or either urinate excessively. 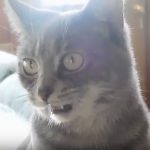 If your cat does not get scared of noises. If you don’t mind the LitterMaid motor noise. SmartScoop automatic cat litter box is a self-scooping solution that helps you to forget about scooping your cat litter box every day. 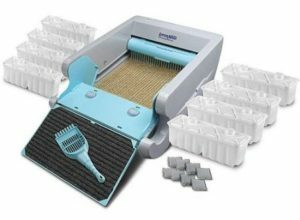 The SmartScoop rake cleans automatically your pet litter box with a delay of 15 minutes after your cat has left it, pushing the clumps forward and lifting them with its rake to make them fall into a waste container located on the back of the unit. Does not use mostly the corners of the litter box and does not urinate a lot. 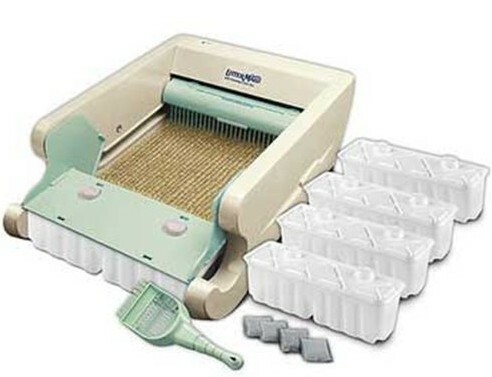 The Littermaid LM680C takes care of your cat’s litter box scooping with a scooping rake that activates 10 minutes after your cat uses the litter box. 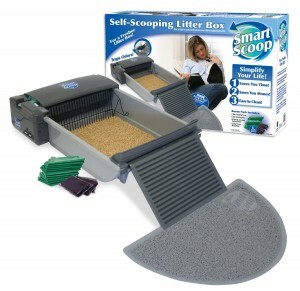 The scooped waste is deposited in a waste compartment located in front of the litter box and covered automatically by a lid that contains a carbon filter to reduce odors. 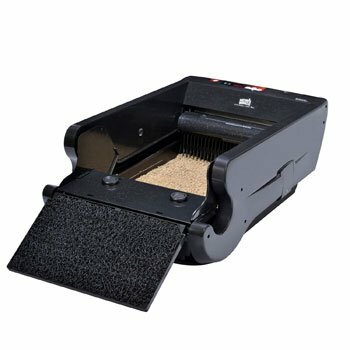 The LitterMaid Classic Series LM580 cleans automatically the cat litter box through a rake that gets activated 10 minutes after your cat has used the box. Once the pet leaves the box, dual motion sensors activate the unit to clean it pushing the waste into a compartment where it will stay sealed and with a carbon filter to reduce odors. The unit comes with 4 waste receptacles, 4 carbon filters, and one scoop. If you want more receptacles or filters, the Littermaid LM680C it is the same Classic version but it comes with 8 receptacles, 8 carbon filters, and a ramp. Cats that don’t use only corners of the litter box. UPDATE OF IMPORTANT SAFETY NOTICE: There is a recall for this unit for some potential pinching or crushing hazard to pets. Check more details on this link. Arm & Hammer is an automatic litter box that takes care of your daily scooping activity. 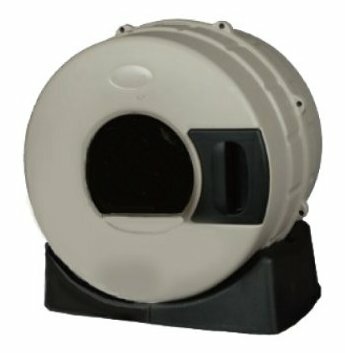 This automatic litter box is very quiet when operating and it features a detachable motor and rake which makes it easy to clean. The unit has a control odor system that uses liners and filter with baking soda, neutralizing the acid present in cat waste. Nature’s Miracle Single Cat self-cleaning litter box keeps your cat litter box clean and fresh. Once your cat has used the litter box, dual motion sensors detect your pet leaving the litter box and 20 minutes later a special rake sweeps the clumps into a plastic compartment which contains a carbon filter to keep odors under control. The Nature’s Miracle automatic litter box features a sleep timer to set the machine “in sleep mode” for up to 9 hours to keep the machine from operating while you are sleeping. The unit can be manually activated for a cleaning cycle if needed. The unit has high side-walls to control litter spillage and a ramp to reduce litter tracking. The rake is removable for easy cleaning. 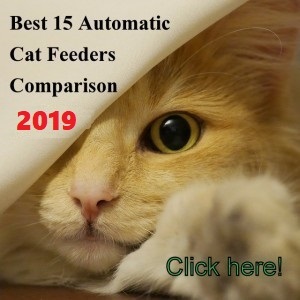 If you don’t like automatic litter boxes or you think your cat won’t handle motor noises very well, as follows you have reviews for the best manual and self-cleaning litter boxes that are easier to keep clean than a traditional litter box. 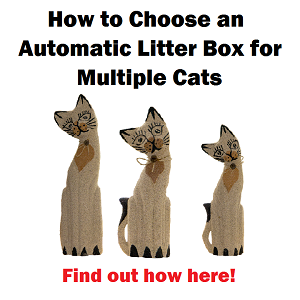 Unlike fully automatic litter boxes, the regular and semi-automatic litter boxes need intervention from you to work. The order is from the highest rated to the lowest according to customers reviews. 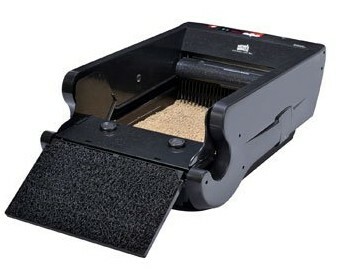 Le You Pet semi-automatic litter box is a great help for cat owners. 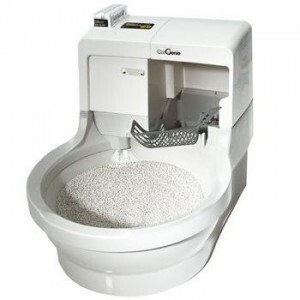 If you hate scooping your traditional litter box you found a solution with this one, because you only need to turn the bucket over to collect the clumps that go to a waste drawer. 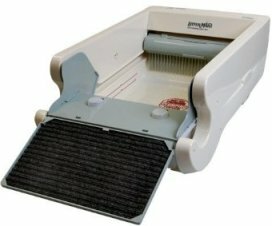 No contact with waste, no more scoopers, no scraping, a simple solution to keep the cat litter box clean in an easy way. 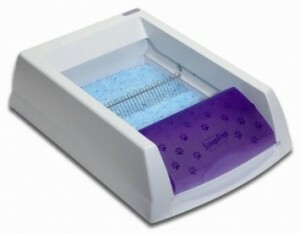 The Omega Paw Self-Cleaning Litter Box cleans your cat feces and urine just in a minute without the scooping task. Inside the litter box, there is a grill that filters out the clumped waste, directing it to the pullout tray. If your cat is shy and could get scared with noises of an automatic litter box. If you have enough room for your cat litter box (especially large size). If your cat is used to evacuate just in the litter area and not all around. 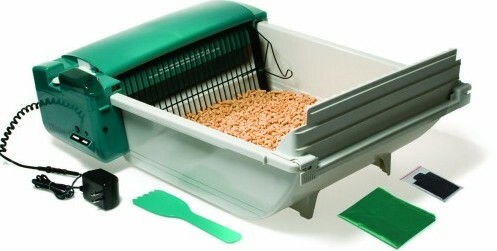 Pet Zone EZ Scoop No Touch works with a rake that you push manually to sweep the litter pan and collect the litter clumps that you lift to dump them into the waste bin located next to it. The waste compartment uses liners that fully wrap it so you don’t touch cat waste. A zeolite carbon filter inserted inside the lid helps to reduce odors. Litter Spinner cat litter box collects the waste through a rotating system that separates the waste from a clean litter with an internal screen. To clean the unit just put your hands on top of the drum and spin it once to make the waste go into the collecting tray-screen. With Litter Spinner you don’t have to scoop the cat litter box anymore. 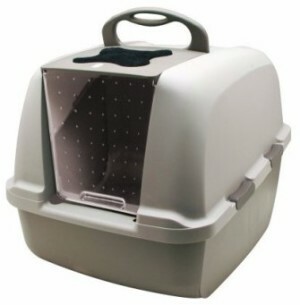 This cat litter box gives cats an enclosed area where to do their “business” which is good for cats that like privacy. 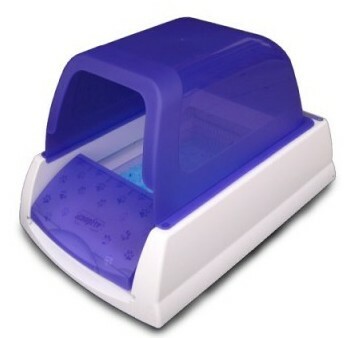 ScoopFree Slide is a manual cleaning litter box that uses disposable trays with blue crystals to contain odors. 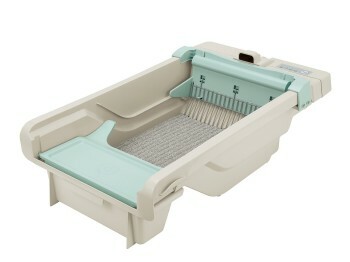 The Slide’s concept is the same of the automatic ScoopFree litter box; the waste is pushed by a rake into a waste compartment on the tray, but with the Slide litter box the rake has to be moved manually for easy cleaning. 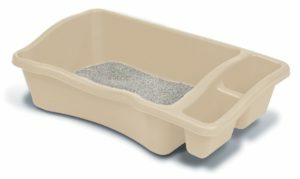 The following litter boxes work similar to regular litter boxes but they offer special features to make the scooping a easier task, such as a different way to handle the cat urine so you don’t need to scrape the litter box to remove urine clumps or a different way to scoop the clumps, higher sides, enclosures, etc. Multi-cat households, even for 2 extra large cats or 3 average cats. 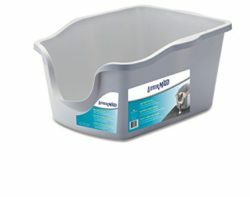 Catit Jumbo Hooded litter box offers your cat the privacy he or she needs providing a spacious litter pan where your pet can turn around to dig and even accommodates a second cat if needed. 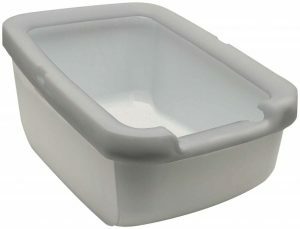 Modko Flip Litter Box is made from solid plastic and features high sides to contain the cat’s urine. The unit comes with recycled paperboard liners that stay in place by a tension plastic band. Even though the Tidy Cats Breeze Litter Box is not an automatic self-cleaning solution, it’s a very innovative system because its special design allows you to control the cat urine smell in your house. For small cats (up to 10 lbs.) that does not dig the litter. If you cannot use regular litter box because of allergies. 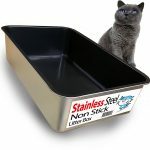 iPrimio non-stick coated litter box is the first stainless steel litter box with ergonomic dimension that fits any cat size and with non-stick properties that ensures easy scooping and scraping of the bottom and sides of this unit. 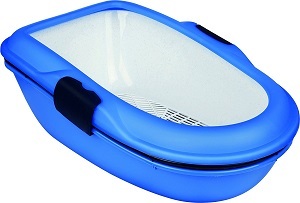 The Catit Litter Pan features a removable rim that helps to stop litter scattering and also helps to keep a liner secure because it snaps on top of the litter box nicely. The unit is made of good quality plastic and it features a slanted shape with a higher back end to help contain litter and urine and a lower entry for easy access for small, elderly or disabled cats. Modkat is a stylish cat litter box that helps to reduce the litter spillage and tracking litter on floors with its enclosed design that traps all the kicked litter. 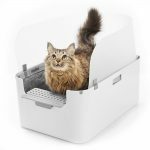 KittyTwister Duo is a cool designed litter box that allows large and tall cats to use comfortably an enclosed cat litter box that can be placed in living areas due to its stylish design that blends in any decor. The KittyTwister was created as an answer to cat owners that can’t find nicely designed enclosed litter boxes, either top or front entry, that can accommodate their large felines. Iris top entry litter box allows you to place your cat’s litter box anywhere in your house, with its nice design it doesn’t even look like a little box. 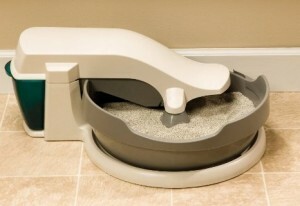 Iris litter box comes with two types of lid, grooved or filtered. Either type help to remove the litter from the cat’s paws, avoiding litter from going onto the floor, reducing vacuuming in half. The lid is easy to remove by pushing the side tabs to release it. 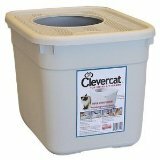 Clevercat is a litter box with a top entry system that features a textured lid that catches the excess of litter from the cat’s paws, reducing the amount of litter that goes onto the floor. The enclosed design helps contain litter from cats that love to dig and kick litter when covering their feces, reducing litter from going over the edges and clumps spillage. To stop a small or medium-sized dog from trying to access the litter box. For a cat that tends to urinate on sides. 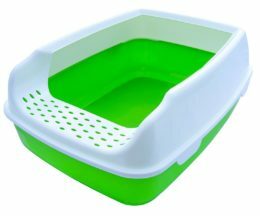 The LitterMaid High Sided Litter Pan with tall sides allows you to contains most of your cat mess when doing its business. It helps to stop kicked litter and urine from going outside the litter box. The unit is made from antibacterial treated plastic to reduce microbes buildup inside the litter pan, avoiding strong odors. Modkat XL is a good solution if you are thinking of getting a top-entry litter box for your cat but you are afraid your kitty may not use it. The XL allows you to switch to a front-entry litter box by removing the front cover and placing the step, that’s all. 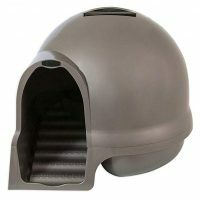 Kitty A GoGo is a cat litter box that features a dome and a base that you can slide-out as a drawer. You can choose beautiful designs and colors, adding style to your home. 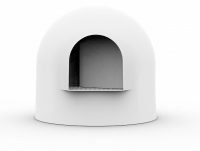 The dome features a recessed handle so the unit can be easily carried and it has vents that allow air circulating on the inside of the litter box. 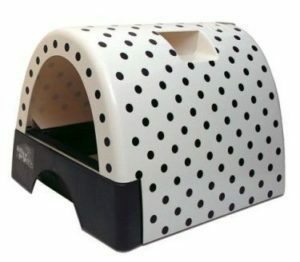 Petmate Booda Clean Steps is a nice designed enclosed cat litter box that helps to keep the litter area neat with its grooved stairs that removes the litter from the cat’s paws as the feline exits the litter box. 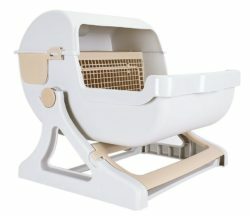 This unit is large enough to accommodate most cat sizes and it comes in 3 colors, Pear White, Brushed Nickel and Titanium. 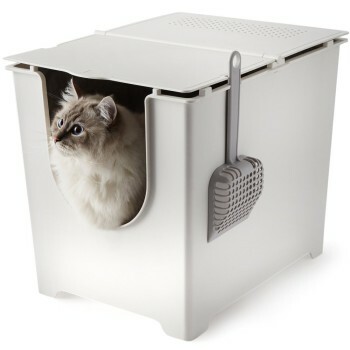 Pidan Studio Snow House litter box is a cute designed unit that helps to prevent litter spillage and it contains odors. The walk-in grate in the entry helps to clean the cat’s pads when the cat walks out of the litter box after use. Two Meows Cat Litter Box features a built-in scattering guard to contain the litter, ideal for cats that are heavy litter kickers and diggers. The unit is made of plastic with anti-stick properties that make it easy to scoop because clumps don’t get stuck on the bottom of the litter box. The Two Meows litter box has high sides that help to contain urine and feces and an entry that helps cats to enter the box more easily. 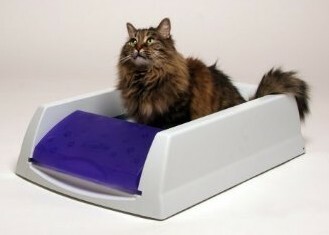 Modkat Open Tray is a high sided litter box that comes with a splash guard adding extra height. 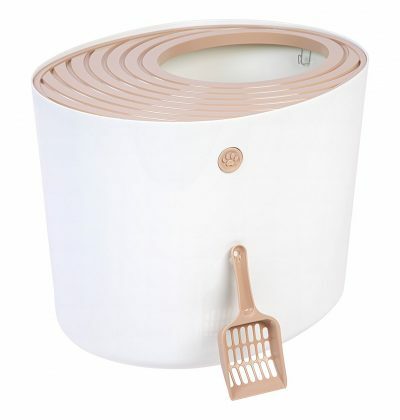 The litter box is suitable for cats that are messy diggers and for felines that urinate against the wall. If you need a quicker way to clean your cat’s litter box, the Trixie Berto is a good option. 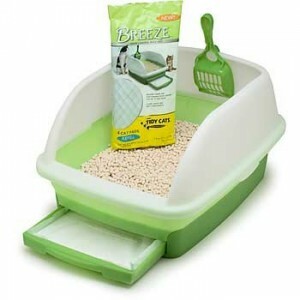 With a simple system of sifting clean litter from clumps you can maintain the litter box in less time. This is a good option if you don’t like scooping. No plugs, no motor noises that could scare your cat. I am inquiring about one of the Bubble self-cleaning litter boxes, however, I have five cats. I was wondering if I should invest in one or two. I was thinking of purchasing one while keeping a couple of regular boxes for them to use, just to see who is willing to use it and who is afraid of it. If I see all of them using it, should I buy two to insure the quality of the Bubble? I’d much rather prefer an email response, but I’ll keep an eye on this forum as well. Hello Akiko! 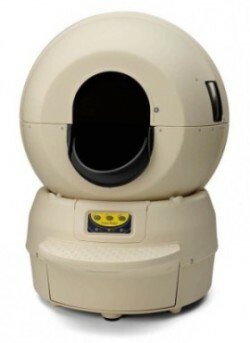 I think your idea of getting one unit and see first if they all get used to the Litter Robot it’s a good approach. Then, if you see them all using it, you can purchase a second one. One single unit won’t be enough to handle 5 cats. Thanks for your question! I have 2 girls who are basically indoor kitties. They only go outside on the patio, under supervision. Dusty is age 14, about 10 lbs. Pixie is about 6 I think (she’s a rescue) & prob. at least 15 lbs. 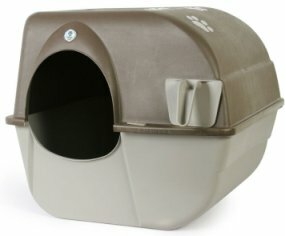 I would like something to help with litter box duty, don’t have much money but am shopping around. Hello Miriam, you can choose any fully automatic litter box or semi-automatic litter box. 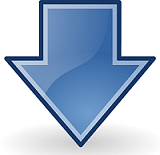 You will find full reviews here and decide which suits the best to your needs. Good luck! In your review of the Breeze system, you noted one of the downsides was the need to replace the litter pads frequently. There is another option. 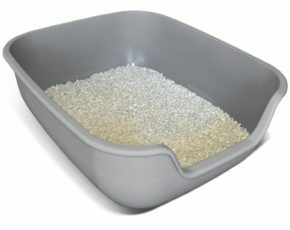 Amazon carries an alternative litter pan for the Breeze pellets called Cat-lilac. It’s a little bigger than the Breeze pan plus, instead of using pads, it has a holding tank that collects and contains the liquid waste. All you have to do is take it to your toilet once per month and pour it out. You can put your own fragrance or deodorant in the tank to eliminate odors. With this option you get all of the benefits of the Breeze Pellets with none of the disadvantages. Thanks for the great tip, Perry!! I’m wondering if your Litter-Robot III Open Air is still working well and if you’ve had any issues. I’m a little worried about longevity of this product. Thanks. Hi Lori! My Litter Robot is still working without issues. Just make sure to always put the right amount of litter and clean it once a month if you have one cat. Hope that helps!